Have just come back to Dublin after spending a weekend with my family in co. Kerry, including my brother Chris. 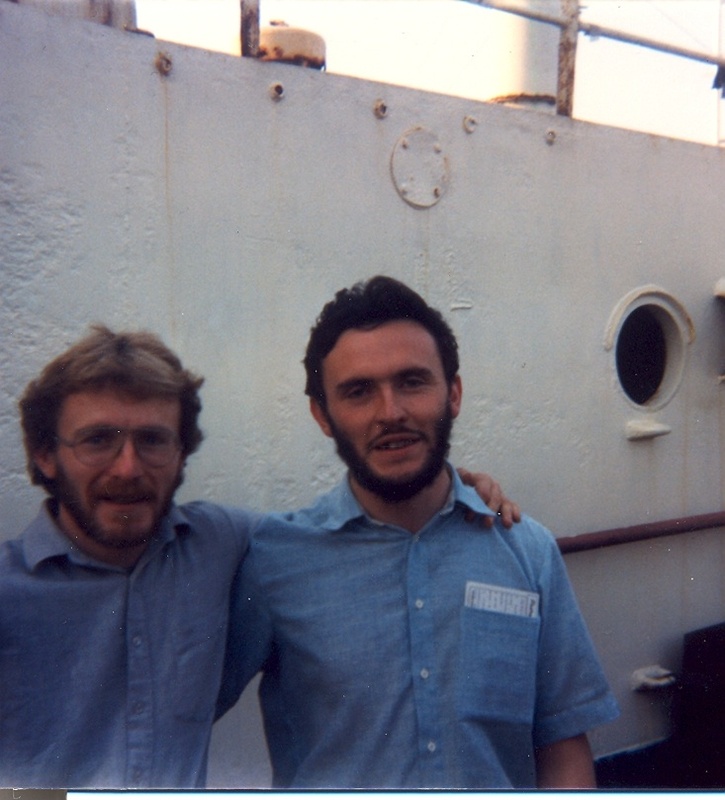 Chris and I both worked for Radio Caroline at the same time in the 1980s, and indeed were often on the ship together. In fact, there was a time in December 1987 when acute staff shortages after the collapse of the big mast meant that ours were the only two voices on air for a period of about two weeks! Sometime during the autumn of 1987, John Burch got a photo of the two of us together, which he published in the Caroline Movement Bulletin under the title “Brothers In Arms” (referencing the best-selling Dire Straits album which had been huge a couple of years before. More recently, I was pleased to be able to borrow the picture from John for use on the front cover of Shiprocked – Life On The Waves With Radio Caroline. This weekend, Chris and I decided that it might be good fun to recreate the photo – the 1987 and 2009 versions are seen below. It will be noticed that a few changes of physique and hair colour have taken place over the years! 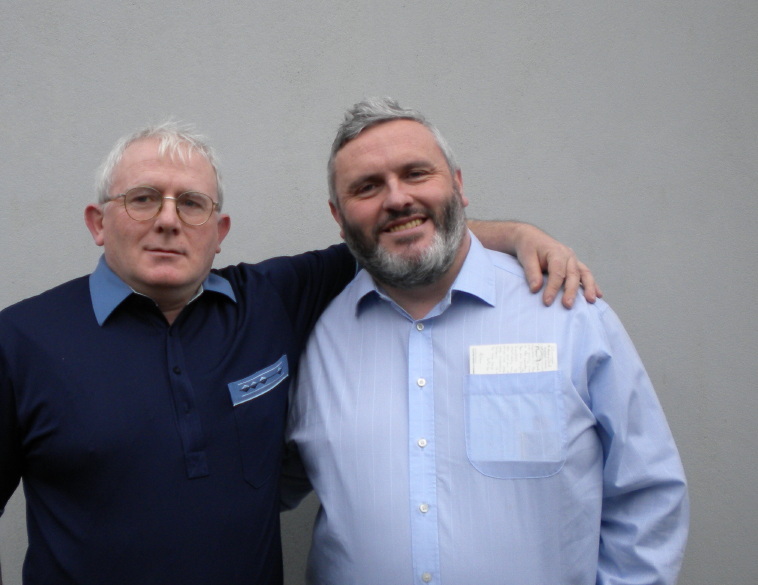 Brothers In Arms 2009 - Chris Kennedy (left) and Steve Conway safely on dry land. Though not an iPhone owner yet (waiting until they are on Vodafone) I’m pleased to see the below news from my friends at Phantom 105.2. This will be one of the first apps I get when I do get the phone! The new Phantom 105.2 iPhone app is now available free for iPhone and iPod Touch devices worldwide! – E-mail your requests directly to the Phantom studio! 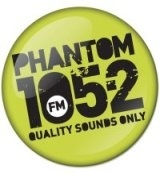 To download, go to App Store and search for “Phantom 105.2” on your device. Please note: You should be aware that the Phantom app may download a significant amount of data while it’s running, so please make sure that you have an appropriate data plan if you connect through your mobile network or on a public wi-fi network. I’m taking part in two readings this week, one of which is very special for me. On Wednesday 25th November Seven Towers will be holding their usual “Last Wednesday” open-mic at Cassidys of Westmoreland Street, with poets and authors including Oran Ryan, Ross Hathaway, Eamon Lynsky and Bob Shakeshaft. I’ll be reading a newly-written short story, my first real piece of fiction. Doors open 7pm, admission free. On Thursday 26th I will be going back to my roots, with a special reading at Dundrum Public Library, at 6.30pm. I’ll be reading excerpts from SHIPROCKED – Life On The Waves With Radio Caroline. Dundrum Library is where, at the age of 5, I was taken by my mother for my first introduction to the world of books, over the years I borrowed hundreds of titles there as I was growing up, so to return as a published author is a special treat for me. Again, admission free, and signed copies of the book will be available. Phantom and it’s staff are up for two awards on the Entertainment.ie website: Sexiest Radio Voice (Charlotte Flood) and best breakfast show (Pure Morning). Here’s the link if you want to give us a helping vote! Have just come back from my first ever visit to Amsterdam where I was a guest at the wonderful annual Radioday run by the Foundation for Media Communications. At least a couple of hundred former offshore pirate staff and listeners attended, making it both a reunion with people I haven’t seen for years, and a chance to put faces to names of people who have been buying Shiprocked. There were some great panel discussions, including a very interesting one on Laser 558 / Laser Hot Hits, an interview with Keith Skues and a talk about AFN. I spent an hour on stage in conversation with Nigel Harris, who also has a book out about his radio days (review here when I manage to get hold of a copy – it was sold out on the day). Nigel is such an easy and interesting person to talk to, the hour just flashed by. A great day, very well organised – can’t wait for next year’s one!